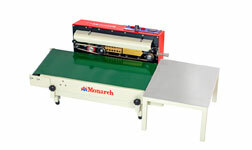 Monarch Appliances : Packaging Machinery, Hand Sealer, Foot Sealer, Liquid Sealer, Continuous Bag Sealer, Gas Flushing Machine, Shrink Machine, Sleeve Wrapping Machine, Strapping Machine, Tapping - Strapping Machine, Auto L-Sealer, Cap Sealer - Induction Sealer, Stretch Wrapper, Pallet Wrapper, Vacuum Machine, Customized Machine, Hot Air Gun, Barcode Printer, Inkjet Printer, Monarch Appliances Rajkot India. 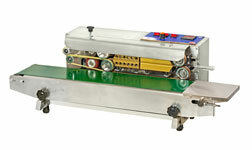 CONTINUOUS BAG SEALER HORIZONTAL M.S. 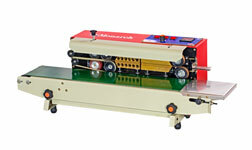 CONTINUOUS BAG SEALER HORIZONTAL S.S.